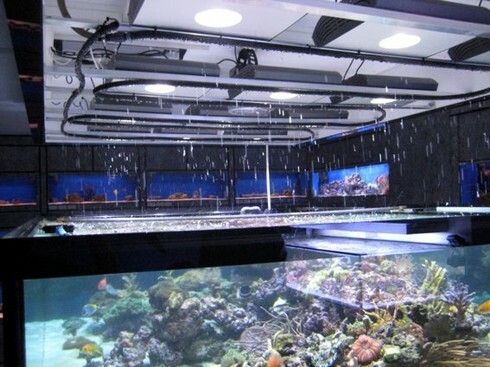 We’ve all seen several LED systems simulation lightning over reef tanks, but this HP Aquaristik system is just so much better. Designed with the goal of replicating nature, this system simulates cloud cover with LEDs which are individually controlled and dimmed. Rather than providing a fixed intensity throughout the ON period of the lighting cycle, this system outputs varied degrees of power over the different zones. Next comes a true thunderstorm! The thunderstorm program includes LED lightning flashes, which increase in intensity as the storm develops. The last, and definitely coolest, part, is a 2 minute rain shower. An integrated tube system drips rain drops on the entire system, providing not just an amazing visual effect, but also serving as a partial auto top off. The whole cycle lasts 8 minutes, with the last 2 minutes featuring rain. Here is a nice video showcasing the system.